Recently I went to a super-fancy mall GAP Inc retail store here in US and bought a couple of shirts (priced above Rs. 2000 easily). I came back and noticed the tag on the inner side of the shirt said “Made in India”. It may not be an unusual sight for many of you but it got me thinking an article about our apparel market in India. Different attires for different occasions: 13% of Indians say that they wear similar clothing at work, social occasions etc compared to 40% of Chinese consumers. A family activity: 70% of us go shopping with family, and 74%, more than twice the average of China, say that shopping is the best way to spend time with family. Relatively high spending per person: Correspondents say that they spent around Rs. 8000 last year, which is comparatively high by Indian standards I would imagine. Quality Test: 50% of Indian consumers they can access the quality of the garment without knowing taking its cost into account. Foreign Brands: More than 50% of Indian said that foreign brands are of superior quality and value than local brands. Let’s build on that last fact a bit more because I think it’s worth noticing that vis-à-vis what I see in United States. Most of us think that foreign brands (Levis, Benetton etc) are of high quality and are ready to shell out a premium for it. Interestingly companies like GAP and its subsidiaries make huge profits selling apparels made in India in most international locations and control only the managerial aspects of their business. 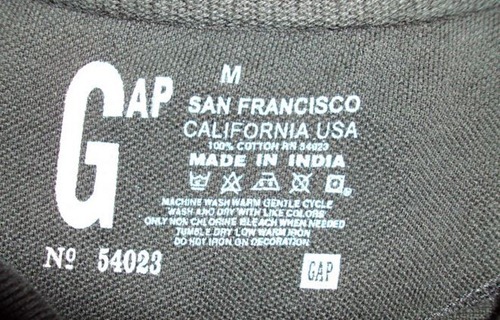 The day isn’t far when we will buy GAP’s Made in India apparels and will be more than happy to pay a premium for it! What are some of the outcomes of this trend? First, it opens up the market and gives opportunities to Indian retail giants like Future Group etc. These retailers sell their relatively decent quality apparels at a lower price and tap the growing middle class, which is increasingly becoming brand conscious. Not to mention foreign brands also trying to capture a chunk of this market, Levis Signature anyone? Second, many will believe that we are becoming more globalized and fashion conscious. So I don a Benetton jacket in my group of international friends and feel “cool” about it. Third and most important point is the overall effect on our SMEs who have been in the business since years. Going one layer deeper the impact on the weavers, laborers, and similar workforce has been rather dismal. Consider the independent weavers in cotton and silk industries. For them the bulk of sales came from “Mandis” and direct selling to consumers. These days the machine made cloth and specially “high quality” brands have made them totally obsolete. A typical Banarsi Saree cost is almost half these days because the weavers don’t get enough customers. Any analysis on these weavers will easily reflect their plight and in-fact many of them have families starving for days. Another issue is the export of cotton to foreign brands. There is a massive demand for cotton in the country. If under such these conditions yarn is exported out of the country then finished garment manufacturers will come under tremendous stress. Consider this, fabric prices have only gone up by 5-10% whereas cotton has gone up by 30% in last few years. I don’t know it’s a critical question that I do not have a specific answer but what I do know is that government, SMEs, and other institutions have to find a solution for this situation. Otherwise, my grandchildren will be surprised to know when I tell them that the shirt they are wearing could be hand-made by our weavers. DISCLAIMER: These are just my opinions and reflect nothing on GAP, Levis and other companies or person mentioned in the article. Oxford Dictionary includes 2000 New Words – Tweetup, Chillax, Netbook, Vuvuzela and Paywall makes a Cut ! Hopefully it will work out well. that was a great discussion. great points put by Altaf and initiated by Ravi. Thanks for such insight. Yeas govt is equally responsible for making this circle go on and on. We(farmers) sell cotton at low prices and they sell us the clothes at high. We buy their chemicals at sky touching prices and out govt. is quite! Yes, it’s none other than govt who can stop it. And in case of the middle men getting the big picture it’s responsibility of govt and the private sector in the field. Farming and related basic industries are considered low profit makers; and that’s where we miss it! There are many initiatives to handle these things by the textile ministry, like 1000+ crore textile parks at many places one such being here(http://www.metrohtpl.com), but see the fundamental mistake by govt. they grated it in westrn maha. where no one produces cotton; vidharbha and marathwada in maha. are the best places for this. Also there are no alternative businesses ther. This could have been a revolution to their(Vidharbha, Marathwada and Some districts of the Andhara Pradesh). Bust stup*d govt. Why is it that China can buy raw material at Higher cost from us and sell the products at lower cost; it’s firstly the Humane resource and then skills and(&& :)) both in series! We have first and missed the second, we failed. So it’s responsibility of the new comers in the garment industry to tap the second thing and win the shirts! This needs greater understanding of India and Bharat and will possible only when our B-schools start focusing our own case studies and entrepreneurs consider this as an fundamentaly stong business area. Thanks for the ‘mast’ post! Altaf made good points there, in fact most of the time we see a ‘Made in China’ tag over most of the clothes we found in US stores, and the reason fr this is the point you made. We need to be more informative and think of the bigger picture for sure! Despite the fact that India produces raw cotton in abundance our farmers as well as Textile Industry are facing troubles. Hello Arun!! Thanks for the remarks. I firmly believe that we should not export anything in raw form. Iput strong comments earlier reg iron ore exports too. Same process same greed of middlemen same govt pathetic policies, same suffering of nation. We export cheap iron ore to china, china makes steel out of it, competes with our steel in int’l market. We export raw cotton to china, china makes cloths out of it, competes with our garments in int’l market. We export english teachers to china, china improves their english skills, compete with indian service industry. We allow china to export every item required for us in our day to day life, while we cant do that becasue we dont know what they need in their daily life, we dont know their geography, we dont know sh** about them. We recognize tibet as part of their territory, in return they never acknowledge arunachalpradesh as part of india. All these problems because of our pathetic politicians. I wish some strong leader emerges in India (I dont mind even if he is a dictator) who can discuss each issue with each country on equal terms. Like “U give me this, I give u that” U agree to this, I agree to that”. At the moment we have no guts. Excellent points made…really informative. Infact, the article as well the comments brings out the grim picture of what goes on. Let me put few facts about cotton process from raw cotton to cloth. 1) Raw cotton is weighed in bales. 1 Bale = 170 kilos. 2) India produces around 500 lakh bales. Now the cotton facts about my state Andhra. 1) Many cotton farmers commit suicide due to bad prices for their output and more expenses to grow cotton. Now why we are suffering while the whole world is happy? 1) We indians are cheap, greedy bas****ds. We dont care how much we can benifit if we follow the sequence of processes. The trader who gets his hands on the raw cotton simply sells to chinese coz he makes immediate cash. HE dont give a damn to the big picture. 2) Our governments have left people to slug it out. They never made policies which will guide individuals. The govt policies make people believe that every bas**rd has to slug it out for himself if he intend to survive. If only our cotton remain in India till it becomes garmet (many value addition processes are there from cotton to garment), it not only generate compititive garment in int’l market, but also provide jobs for millions and bring out a product which can challenge chinese cheap product in the pricing factor. Imagine one lakh bales of cotton providing 60,000 jobs and our exports of 100s of lakhs of bales of raw cotton exports!! So many millions of jobs shifting to china from India !! If I have it my way I will execute the govt for allowing such a disaster still going on. Thanks Altaf for your insight and infact valuable information. While I completely agree with you on point-2, I would differ on point-1. In a real world scenario that would almost all small traders/businesses look in the short run so from their perspective it makes sense to get fast and easy cash money. So i think fixing point 2 should fix point 1 automatically.